Awaken Kuan Yin's light within you and shine it into your life and into the world. Open your heart and take the journey of your blessed, beautiful life. 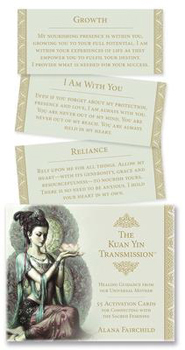 Experience the Kuan Yin transmission and reinforce your connection with the sacred feminine with this enchanting card set from bestselling author Alana Fairchild. The messages can be used for spiritual contemplation and for divining for yourself and others. Small enough to rest on your desk or keep in your bag, this deck is a supportive and convenient reminder that the Universal Mother is with you always.